For walls: Uprise Art is an online art gallery started by the super smart Tze Chun. They focus on all contemporary artists, with many pieces under $800 (as well as pricier ones). It’s perfect if you want to start collecting but don’t know where to start. I’ve bought a couple things over the years, including one of these adorable Lump Nubbins sculptures, and a couple colorful abstract pieces. Plus their team is happy to hold your hand and give you recommendations (or even do an at-home consultation if you’re in New York). For sitting: My friend and former Birchbox-er Nidhi started Maiden Home a couple years ago after being frustrated by the furniture-buying experience. All her pieces are made to order in the U.S., and can be customized every which way to make sure they fit your space and style—plus they’re half the cost of similar models at Room & Board and the like. For adding style: I’ve been a fan of Rebecca Atwood since she first launched her line of beautifully printed pillows, and I recently stopped by her studio to catch up and get a peek at her new bedding collection (gorgeous). I love how her patterns strike the right balance between striking and subtle; we used her Chasing Paper limited edition wallpaper in Lilly’s nursery and I’m planning to use one of her fabrics to reupholster my mom’s old wing chairs. It’s not inexpensive but worth it if you have a quality piece you want to resuscitate. For hiding things from babies: Of the big brands, I’ve been the most impressed with CB2’s ratio of design to quality to price: I bought this fun bureau for both my bedroom and Lilly’s, and we put a bunch of these shelves downstairs. I’m going to pick out a couple storage pieces to keep our dishes and knickknacks safe from curious babies. Coconut Lemon Tea Cake: I made this lemon loaf cake this weekend and was reminded how ridiculously easy it is—plus it’s made with yogurt and coconut oil so it’s basically health food. It’s from Alison Roman’s Lemons Short Stack Edition and is exactly the thing to inject a bit of sunshine into gray wintery days. Salted Chocolate Chunk Cookies: Two things I love about this Smitten Kitchen recipe: you don’t have to refrigerate the dough, which is very important if you have a cookie craving that needs attending to, and they’re even better made with half or all whole wheat flour. Spelt Almond Cake: This Violet Bakery cookbook number is so tasty and adaptable that I’ve probably made it a dozen times. 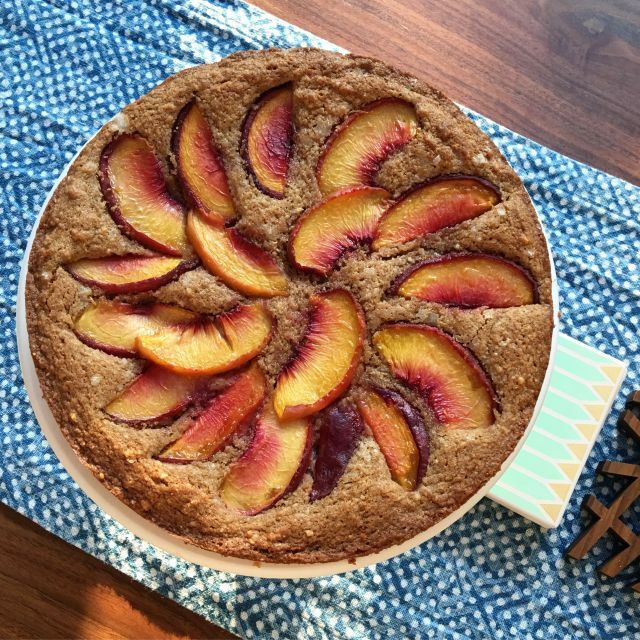 I’ve baked gluten-free versions with buckwheat flour and topped it with pears, peaches (see above), strawberries, and apples. Perfect for dinner parties; don’t forget the vanilla ice cream. Listening and taking notes: You know that meme about how you have as many hours in a day as Beyoncé? Well I look at someone like Doree Shafrir and feel like a total slacker. Not only did she write a bestselling *novel* while working at BuzzFeed, she has two successful podcasts. Her latest, Forever35, is about “the things we do to take care of ourselves,” including vision boards, brightening serums, and more. It’s a smart take on beauty and self-care and will inspire many a purchase. On the complete other side of the spectrum, I continue to be impressed with The Information’s 411 podcast. The subscription-based news company has the best tech reporting out there but if you’re not ready to commit this is an excellent way to sample it or just keep up to date on everything from AirBnB’s quest to enter the airline space to Amazon’s latest shenanigans. Lilly says: It’s time to retire the treetop friends now that she’s rolling up a storm. New bestie: this Skip Hop foam playmat. We spread blankets and toys out on top of it and she’s got a cushiony little wonderland. That’s all for now – send any requests for next week! P.S. New? All old editions live here.